Victory Bees is owned and operated by Brendan W. Cornwell. Along with reading and collecting a small library of apiculture books, he has taken classes on organic and natural beekeeping from Ross Conrad in Vermont and master beekeeping classes put on by Dyce Laboratory for Honey Bee Studies from the Cornell University Apicultural Extension Program. Brendan continues to travel the country learning from some of the top experts in beekeeping to gain a full picture of historical and modern apiculture. Victory Bees is very committed to doing what is right for the health and future sustainability of bees. Victory Bees apiaries are established at four different organic farms in the seacoast of New Hampshire: Meadow’s Mirth Farm in Stratham, Pickpocket Farm in Brentwood, New Roots Farm in Newmarket, and Stout Oak Farm in Epping. With every decision made, the question is asked, is this good for the bees? Victory Bees bees are pesticide and synthetic miticide free. 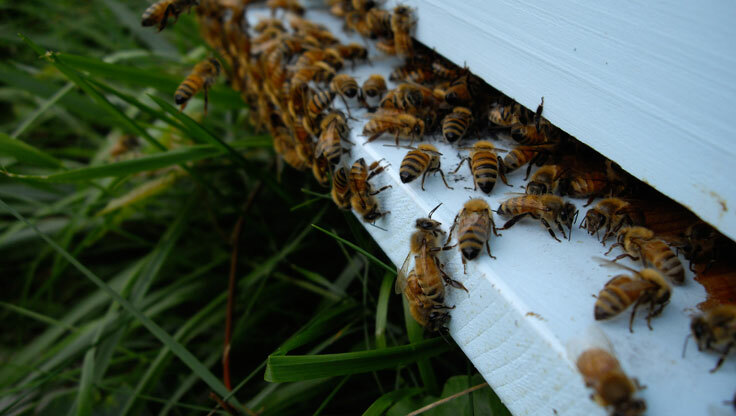 Integrated pest management (IPM) techniques, such as screened bottom boards, drone comb, limited foundation, and powdered sugar treatments, are used to keep the bees healthy. Victory Bees honey is sold raw and unprocessed, and as a result the honey is naturally creamed. All honey contains sugar crystals; these sugar crystals multiply as the honey changes from a liquid to a semi-solid. Most commercial beekeepers heat their honey to slow the crystallization, and in turn many of the beneficial enzymes, pollens, and other components of the honey are destroyed. Victory Bees produces great natural honey using techniques that were popular hundreds of years ago but have been largely forgotten in modern times. Victory Bees uses traditional Langstroth hives developed in 1852 by L.L. Langstroth but also uses top-bar hives (TBH). Top-bar hives are one of the oldest ways to keep bees, dating back to the ancient Greeks, and are a more natural way to keep the bees. Top-bar hives let the bees build comb from scratch in a shape that they would more likely build in the wild.